The Los Angeles Department of Transportation (LADOT) Bicycle Program installs bicycle racks in the public right-of-way (City property) to encourage bicycling to shopping, school, and play. Bicycle racks provide secure, convenient, short-term bike parking at office buildings, businesses, or stores near public sidewalks. The LADOT Sidewalk Bike Parking Program uses an inverted-U bicycle rack. It is 36″ high constructed of 2 3/8″ galvanized pipe and holds two bikes. The rack provides good support to the bicycle, and users are able to lock both the wheels and frame of the bicycle to the rack. The rack has no sharp edges or moving parts and is virtually maintenance free. Racks are installed at the request of business owners or citizens. The City assumes responsibility for the rack but not for bikes parked on it and the racks remain the property of the City of Los Angeles. 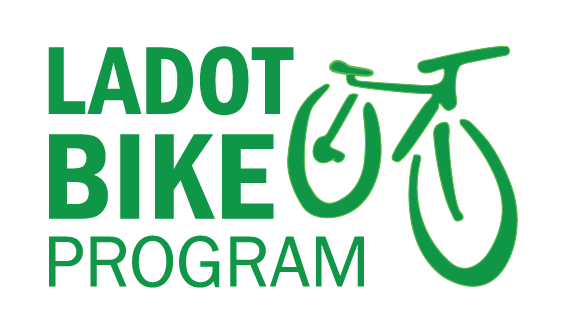 The Bicycle Program will contact those requesting information about bike rack installations to answer any questions about their requests. There is no fee for a bicycle parking rack and installation is free. 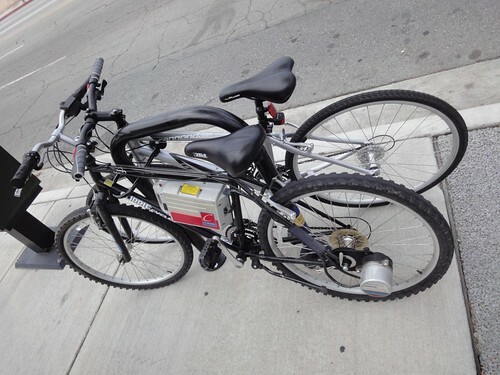 If you notice a rack has become loose or damaged please contact LADOT at 213-972-4972. Racks are installed in the public right of way within the City of Los Angeles. They are placed to comply with ADA requirements and to avoid conflicts with pedestrians and parked vehicles, usually near the curb and away from building entrance-ways or crosswalks. Racks may be installed by bus stops or loading zones only if they do not interfere with boarding or loading. Los Angeles, CA 90012 . The information should include: name of business, contact name, telephone number, street address, nearest cross street, number of racks requested, and Council District number. To view a list of “marked” rack locations, please visit our marked rack list page by clicking here.